As seen in "MythBusters: Killer Quicksand"
Explanation: Just like mattresses, hair dryers come with a stern warning: Drop one in a bathtub, and it could electrocute someone who's taking a soak. The electricity flowing through the cord could jump to the tub's metal drain, sending electricity through a person's highly conductive body. 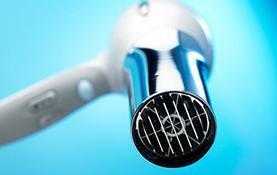 For that reason, hair dryers today are also manufactured with ground fault interrupters that immediately shut down the appliances if they end up waterlogged. But MythBusters Jamie Hyneman and Adam Savage realized that there are loads of electrical devices sitting around bathrooms nowadays, so they tossed a radio, television and, of course, a couple of hair dryers into a bathtub to see whether the situation would have lethally shocking results. For safety's sake, Jamie and Adam molded a ballistics gel bath dummy to be the guinea pig and rigged it up to an amperage meter to measure the amount of current running through it. At 6 milliamps of jolts, the dummy would be pronounced dead. The radio, television and hair dryer without a ground fault interrupter all electrocuted the drenched dummy, confirming the household appliance myth. But thankfully, the modern hair dryer with the safety device also worked like a charm, shutting off before sending any lethal shock waves through the bathtub water.